Explore the magnificent Etosha National Park in northern Namibia on this 6 day self-drive adventure. You’ll spend time on both sides of the park and have a rental car to explore at your own pace. Etosha has good roads and signposts and you’ll easily spend 3 days enjoying the wildlife of the park, from zebras crossing the great white salt pan, lions drinking at the waterholes and the sleek horns of the gemsbok silhouetted against the sunset. On your way back to Windhoek you’ll stay a night in Okonjima Plains, where you can meet rehabilitated cheetahs and leopards on their way back to the wild. On arrival in Windhoek you’ll be met at the airport and assisted in picking up your hire car. 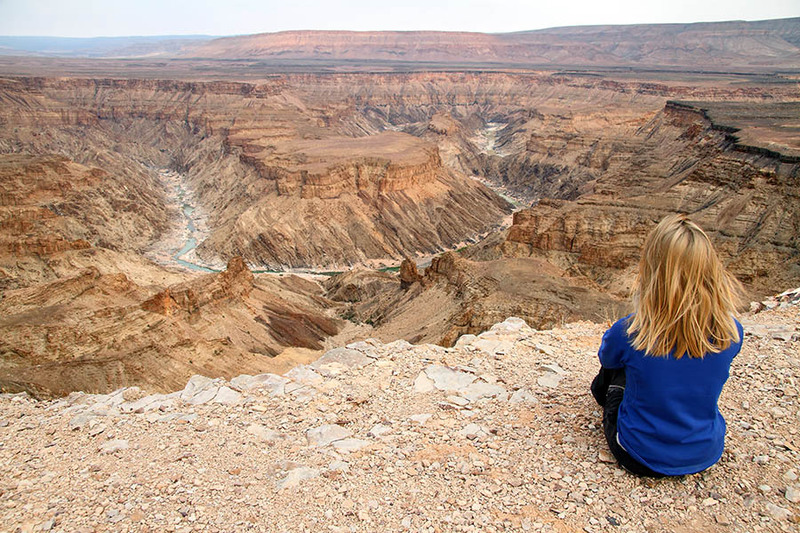 From here you’ll embark on the 4 hour drive to Etosha National Park through the rugged landscape of northern Namibia and check into the Etosha Village on the west side of the park for 2 nights. Your first day in Etosha will reveal the beauty of this desert national park. Famous for its vast array of wildlife, 4 out of the Big 5 reside in the area so make sure you are on the lookout for bathing elephants and lions drinking at the waterholes. 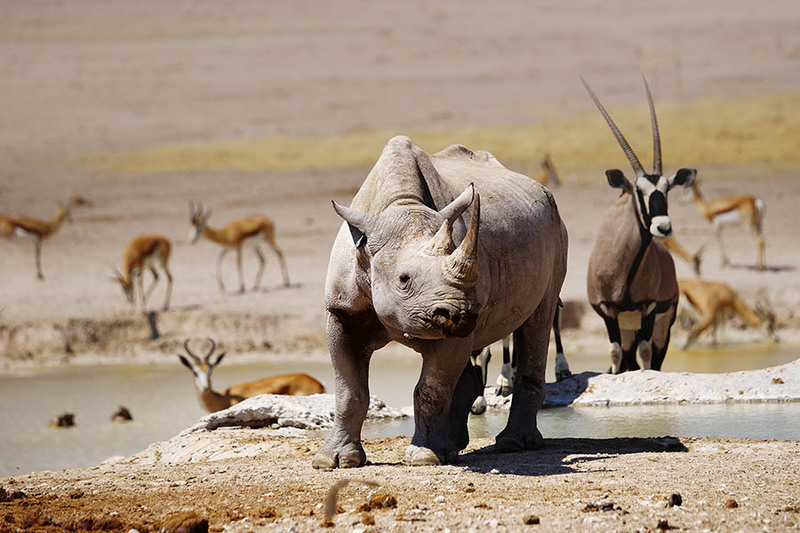 Black rhinos have made a huge comeback and Etosha is now one of the best places in the world to spot these endangered animals. Leopards hide in the undergrowth but you’ll be sure to see herds of zebra and springbok mingling on the plain as well as giraffes wandering from tree to tree looking for a snack. If you want to book a guided game drive, ask one of our consultants to arrange this for you. 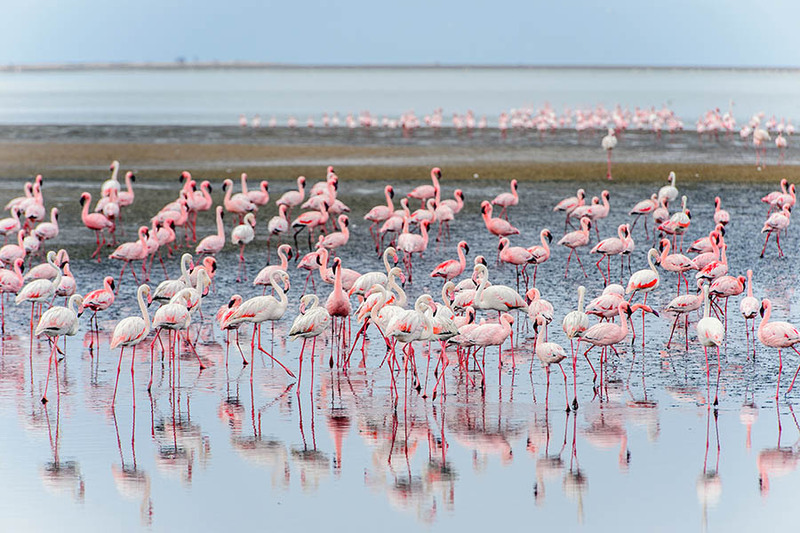 This morning you’ll drive to east to the other side of Etosha National Park, past the huge Etosha pan, a vast salt lake that dries into a cracked white sheet each year. After the rains, this turns into a huge breeding ground for flamingos, with up to a million pink birds descending on the pan when it floods. Most of the time when it’s dry, small springs are used as salt licks for the park’s wildlife, so you might see oryx silhouetted against the sun and elephant families trekking from one side to the other. Arriving on the east side of the park you’ll check into Mokuti Etosha Lodge for 2 nights. With another day to explore the park why not grab your binoculars and go bird watching? Etosha is a haven for birds, from turquoise European Rollers to Scarlet-Chested Sunbirds flitting through the air, sometimes even landing on the backs of the rhinos and elephants around the watering hole. Look out for mighty ostriches, sheltering their stripy chicks from the intense sun or Saddle-billed Storks wading through the rushes. Leaving Etosha this morning you’ll head south and break your journey back to Windhoek with a night at Okonjima Plains where the Africat Foundation has its headquarters. Okonjima is great place to spot one of the leopards that freely roam this 20,000 hectare nature reserve or visit the Carnivore Care Centre where you can meet cheetahs and leopards who are patiently waiting for their second chance to go back to the wild. You’ll also be able to track the animals on foot, looking out for Spotted Hyaenas, Cheetahs and Wild Dogs along the tracking trails. 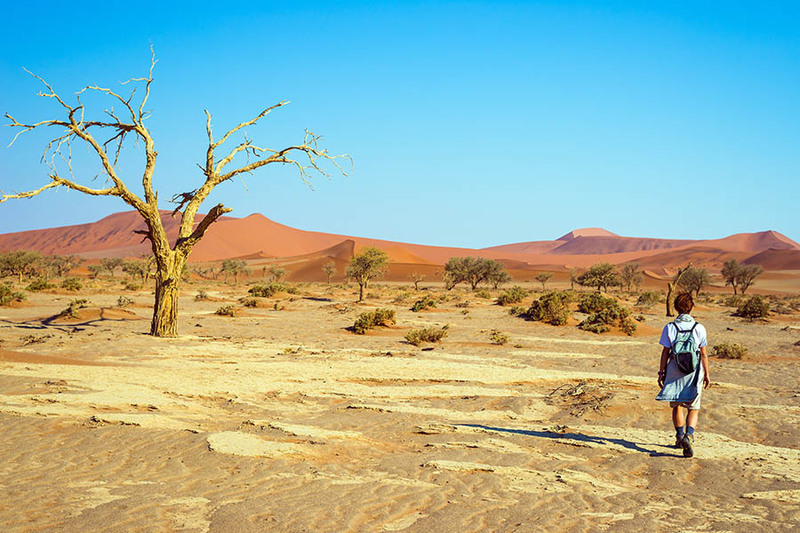 Today is your final day in Namibia – after breakfast you’ll drive back to Windhoek Airport and drop off your hire car before catching your onwards flight. 5 nights in 3/3.5* standard accommodation.